Next is Patti Saylor’s request for change also comes in the form of better training for our first responders. Her persistence in the face of such great loss and her commitment to lock arms with the national Down syndrome organizations to call for and facilitate change has already brought results. Although I am not thrilled that the governor of MD, in my opinion, has used Ethan’s legacy to support his own motives, I am glad that the commission begun there includes Tim Shriver and self-advocates as part of the team to prevent further tragedy. I don’t have to tell you, “special training” is a sore point within our community. It’s one of the subjects where I hope that the parents, caregivers, and advocates all continue to discuss the issue instead of draw away from each other because I feel that with the disagreements and concerns included we, collectively, can be a part of creating a better way. However, if those who disagree choose to walk away or are cut out, the changes will not be for the betterment of our diverse community and we’ll be not much better than where we started. It’s likely we all agree that there needs to be change and it’s assumed that we all hope for a safer more inclusive environment, those points are the right place to start from. #JusticeForEthan, caused us to cry and rally at once. Let’s be sure Ethan’s legacy is about change for the better, not where we divided and part. January 9th will be Ethan’s birthday. January 12th will be the two year anniversary of Ethan’s death. 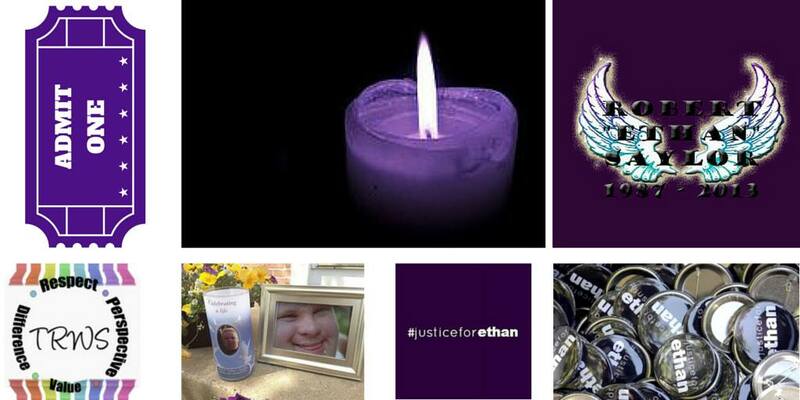 On that day there will be a vigil held for Ethan’s life in Frederick MD at or near the theater where he died. Also, you can take part in an on-line vigil that lasts for the 9th to the 12th by sharing posts and articles about Ethan, and virtual candles in his honor. Of all the reasons we do this, one is solidarity with Patti and the hope that our lives touching hers may help her, and all of Ethan’s family, to heal. How many of us wept at the loss of Ethan and known our sadness is only a fragment of what his family and friends feel at the loss? Even if we have never met the Saylor family, as I have not, I can offer only my one voice in the hopes it is part of the tapestry that covers, warms, and heals the Saylor family. And there is also that knot of meshed up fear, rage, and tears that you, I, we feel ourselves. We need to hold hands and massage that tender spot that is the last two years of loss of innocence, loss of justice, loss of faith in the system and even loss of trust of our neighbors. To bury these feelings does not heal them, we must expose them to the air again, let the salt from our tears sting, and hold each other close. Hold our children close. Hold our brothers and sisters and all we feel powerless to protect and choose to rally under Ethan’s name for a better future and a better world. #JusticeForEthan is slow in coming, but it is still worth fighting for.